Hey guys! I thought I’d write about something a little different today – a selection of the stuff I’ve loved this month. I’ve included a huge variety of things, from my favourite podcast to my favourite protein powder! Give it a read and let me know what you think. I’m currently reading ‘The Sleep Revolution‘ by Arianna Huffington, and loving it so far! It goes into great detail about the importance of sleep, along with the science behind it and ways to improve the quality of sleep you get. I’m only about half way through it, but it’s already made me more conscious of prioritising sleep. I’m a huge fan of being organised, and feel like my life is only together when I use a planner. If it isn’t written down, it doesn’t happen! I saw a people using the Best Self Co. ‘SELF Journal’, and decided to splash out on one for myself. I’m in love with my journal, it takes organisation to the next level! Each journal is 13 weeks long, and doesn’t have dates so you can start it whenever. It encourages you to set a goal to achieve by the end of the 13 weeks, and makes you accountable to that goal. The journal has space to fill in 3 things you are grateful for, both in the morning and at the end of the day, highlighting the importance of gratitude. There’s also space to record your daily wins, lessons learned, and habit tracking. I can’t recommend it enough! It’s a little pricey at $31.99, but worth every penny. Get it here. I think my favourite podcast will probably always be Danny Lennon’s ‘Sigma Nutrition Radio‘ podcast. I’ve been listening to one almost everyday on my way to work, and I feel like I’m learning so much. If you’re interested in nutrition or fitness, I’d highly recommend it. There’s over 100 podcasts so far, so plenty to go back and listen to! I switched to using dairy-free protein powder a few months ago, as I don’t tolerate dairy well, and have finally found protein powder I like! I’ve tried a few vegan protein powders, and could never find one that was even close to tasting as good as whey. The texture is too chalky for me, and I want to enjoy my protein oats! 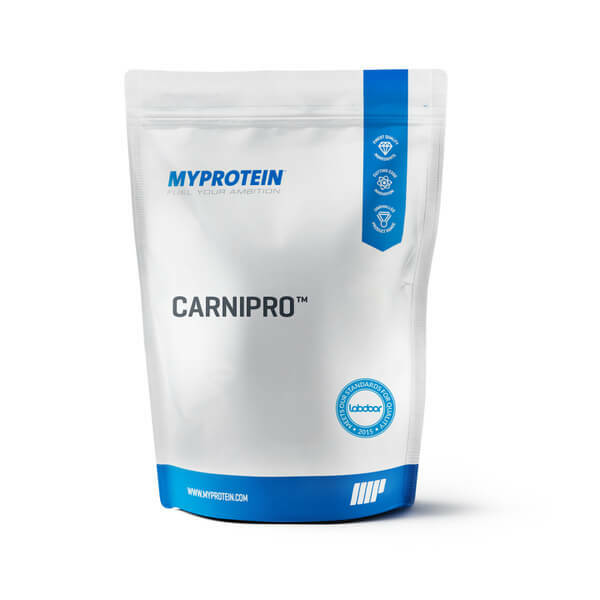 I decided to give CarniPro from MyProtein a try. It’s made from beef protein isolate – I know, sounds kinda weird for protein powder! I got the chocolate flavour, and am really impressed with it. It works really well in oats, pancakes and smoothies. The texture and taste are so much better than any of the vegan products I’ve had. The macros are insanely good – per 25g scoop there’s 24g protein, 0.5g fat, 0g carbohydrate, and 102kcal. That’s more protein than in a scoop of whey! There are a few things that it doesn’t work well in however – it doesn’t mix into yogurt well at all, and I can’t seem to get it to work in Beltsander Brownies either. I haven’t actually tried it as a shake on its own so I can’t say on how it is like that. All things considered, I really like it though! I’m not even sure if ‘snapchatter’ is a word, but I’m going to roll with! I’ve been following Jamie Alderton (aka Grenade Jay) on snapchat for a while now, and find myself always checking his story first. He posts really good information, and is great at explaining concepts really simply with no BS. He’s also really entertaining, so it’s a win-win situation! His username is ‘grenadejay’ – well worth a follow! I’m a huge nerd when it comes to all things nutrition and training related! Lately I’ve gotten really into learning more evidence-based information, and after hearing it mentioned multiple times on Danny Lennon’s podcast, decided to subscribe to the Alan Aragon Research Review. It’s a monthly publication with the latest scientific information on training, nutrition, and supplementation. So far I’ve just read the latest issue, but I’m really impressed! The articles are great, though you do need a basic knowledge of science for a lot of them. You get access to all the previous publications when you subscribe, so I still have a few years worth to catch up on. So far, so good though! I’d highly recommend it to PT’s and coaches looking to up their knowledge game, or really anyone passionate about learning all things nutrition and training in intricate detail! I get waaaay too excited about nerdy stuff! If you’ve made it down this far, thanks for reading! I’d love some feedback on my blog, so please leave me a comment either here or on Instagram and let me know what kind of blog posts you’d like to see in future! Thanks for the suggestion on “The Sleep Revolution”! I’ve added it to the growing lists of books related to brain health I plan to read and review on my site. Aw thanks Angie 😘 It’s such an interesting book 🙌 Same, I find the vegan ones so chalky!